Westerns are certainly not my favorite genre of film. For the most part, I find them boring with some exceptions like the remake 3:10 to Yuma and Appaloosa. These two films are very different from Jim Jarmusch’s Dead Man, a strange, dreamlike Western that explores the themes of death and how we can prepare for it, and through that preparation find out who we really are and what we are capable of. William Blake (Johnny Depp) is an accountant from Cleveland who is offered a job in the town of Machine, despite warnings from the fireman (Crispin Glover) on the train he is traveling on. Upon arrival, Blake discovers that the job is no longer available. No out of work and only a few cents to his name, William decides to drown his sorrows in alcohol and meets a former prostitute, Thel. (Mili Avital). When Thel’s fiance (and son to the man who promised Blake a job) walks in on William and Thel, a shootout occurs resulting in the death of Thel and her fiancé. Now, William is wounded and on the run until he is found by a Native American named Nobody (Gary Farmer). While William travels with Nobody, a group of killers (Lance Henriksen, Michael Wincott, and Eugene Byrd) are on their trail to bring Blake in dead or alive. This isn’t a Western about good guys and bad guys, although the film does have its fair share of both. What really is at the core of this film is a philosophy on death and society. As the title states, William Blake is dying, making him the walking dead. This intense newfound version of mortality brings upon a strange change in William Blake’s character. He goes from being a push over accountant to a gunslinging man on the run who has found peace with himself. It made me think how I would handle myself in that situation. Would I be as accepting as William Blake? There is a commentary, albeit a bizarre one, on society. Machine is a lawless city where bounty hunters are brought in to take care of the murderers and other criminals. Essentially, this is just killers chasing down other killers and getting paid for it. I don’t’ know if I would go so far as to say that Jarmusch is saying using this as a metaphor for police officers, but I wouldn’t discount that theory. The Native Americans portrayed also celebrate killing as something honorable. This served as a reminder that murder is purely a societal condemnation, and humans would kill each other in nature. I’m not saying that the Native Americans are portrayed as cold blooded killers; they merely have different views on the act of killing. This movie is full of stars. Johnny Depp is really in charge of pushing the movie forward and it was cool to see him in one of his earlier roles. Gary Farmer was fantastic as Nobody and brought a lot of sympathy and understanding not only to his character, but to the Native American people. There’s so many other great roles in this with fine actors playing them. 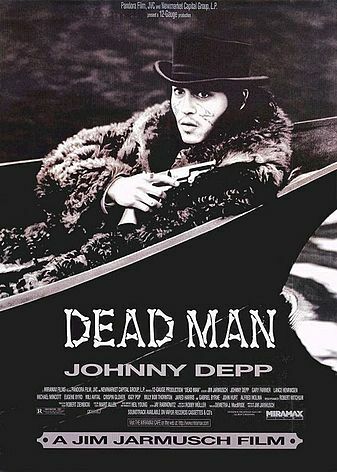 Dead Man features the likes of Crispin Glover, Gabriel Byrne, Lance Henriksen, John Hurt, Robert Mitchum (in his last role), Iggy Pop, Billy Bob Thornton, Jared Harris, and Alfred Molina. This film is a performance powerhouse. As a word of warning to casual film goers: Dead Man is very, very slow. There are times where I didn’t think the story could move any slower and then it did! This is the way to tell the story though. With the overlying theme of preparing for death by discovering your inner oneness with nature is a powerful message. This slow pace perfectly accentuates the arc that William Blake travels. The opening scene where Blake is on the train keeps cutting from the inside of the train, to the mechanics of the train, to the desert. This perfectly shows just how long this trip is taking and it sets up the feeling for the rest of the movie. I also feel the need to mention the cinematography and soundtrack. Robert Müller creates a beautifully bleak atmosphere with his flowing camera work and black and white photography. Neil Young’s music also is a big contribution to the film, and is just as minimal as Jarmusch’s storytelling. These combined are all very important to the atmosphere of the film and immersing the viewer into its unsettling hold. If you feel like you have the patience to sit through Dead Man and think about it long afterwards, as it is inevitable, then this is a phenomenal experience. I call it an experience because I never felt the pulse pounding entertainment that you would feel in a typical Western or thriller. This is a quiet storm that hits the viewer hard with its messages, scenery, and mood. I’d go so far as to call Dead Man a masterpiece. How can a movie that predominantly takes place inside of a single phone booth possibly be interesting? Well, that is what I’m going to explain today with Joel Schumacher’s film, Phone Booth. This film is a success due to its fine direction, expert editing, and perfect pacing, packed to the brim with suspense and intensity. Stu Shepard (Colin Farrell) is not a good person. He is a publicist, who isn’t particularly very good, but still enjoys the multiple lies and trickery needed in order to get ahead. While using a public phone booth to call a possible girlfriend-on-the-side (Katie Holmes), Stu is called by a mysterious man (Kiefer Sutherland), who just so happens to have a highly powerful sniper rifle aimed right at Stu, and will fire on him if he doesn’t obey his every word. Soon, the police arrive and Stu finds himself in a stand-off with the caller and the police. There are many factors that would have caused Phone Booth to not work as a film. The biggest and most challenging factor is making a film that takes place mainly in a phone booth interesting. To do this, the pacing had to be perfect, and it really is. Not once during the length of this movie did I find myself getting bored. Of course, this is far from being a long film, only clocking in at a little over 80 minutes. This is just the right amount of time to properly introduce the characters, build suspense, and release all of the built suspense in a minute of insanity. When I think of really good actors, Colin Farrell isn’t one that comes to mind, but after seeing Phone Booth I know that he has the talent to be great. Unfortunately, this isn’t really implemented save for a couple of films like In Bruges. Katie Holmes and Radha Mitchell do alright as Shepard’s love interests. Forest Whitaker gives a very emotional performance as a police chief with an obvious battered past. Kiefer Sutherland is the perfect choice to play the Caller, and he does so with menace and sounds genuinely like a sociopath. The writer of the film, Larry Cohen, actually pitched the idea of a film centering around a single phone booth to Alfred Hitchcock in the 1960s, and Hitchcock thought it was a great idea but neither of them knew how to keep the character trapped in the booth. Cohen came up with the idea for a sniper in the 90s, but more to the point, this film definitely feels like it is a modern day Hitchcock film. The real intensity comes from the suspense and the performances, which is what Hitchcock was all about. Michael Bay was set to direct at one point, and the first question he asked was, “How do we get him out of the phone booth?” Getting Stu out of the booth would have ruined the whole point of the film. 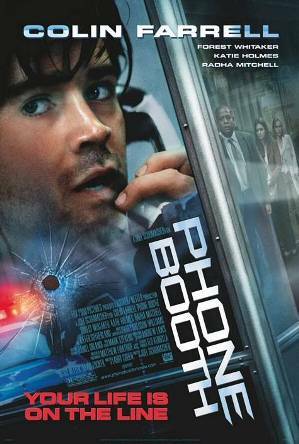 Phone Booth had the potential to be a terribly boring movie, but Schumacher and his crew did a great job at crafting a meticulously good story filled with suspense and questions of morality. Do the sniper’s actions justify the means? Of course not, but the audience of this movie definitely have discussion points after this movie. I can easily recommend Phone Booth to anyone looking for a suspense fully wicked good time. Every now and again, a movie is made that deeply criticizes our government and calls out those responsible for certain crimes and schemes. It makes me wonder just how great our “great nation” actually is. Casino Jack is one of these movies, and while I felt contempt towards the multiple characters in the film, I also laughed at the brilliant yet not always subtle satire. Jack Abramoff (Kevin Spacey) was one of, if not the, most influential lobbyists in Washington, and he only gets bigger when his associate, Michael Scanlon (Barry Pepper), proposes the idea of cheating a Native American casino out of money. As their profits rise and another casino wants to make a deal, mistakes begin to be made when the bring pseudo-mobster Adam Kidan (Jon Lovitz) into the mix as a business partner. What comes next is Abramoff’s sharp decline in power and respect, ultimately ending his political career. The choice to make this film into a comedy is a good choice. It keeps the mood light and the politics easy to understand, as long as you know a little bit about the government and its workings. Kevin Spacey gives a realistic performance (no surprise there) and makes Abramoff almost sympathetic, which is not an easy task. I really enjoyed seeing Barry Pepper not play a soldier or a man stricken by the plight of war. I didn’t know exactly how he would be in a film like this, but he was really good. Jon Lovitz provided this film with its biggest laughs and stole every scene he was in. When a movie makes you think, than it is doing something that all movies should, but not all succeed in. When Casino Jack ended, I was really happy with it, but I was also confused and angry about how people, especially in positions of power, can so easily get away with schemes like the one that Abramoff was involved in. If our government can’t even control its lobbyists, who are in a strangely authentic position of power, than how can the people of the country know what is really going on behind the walls of the senate. 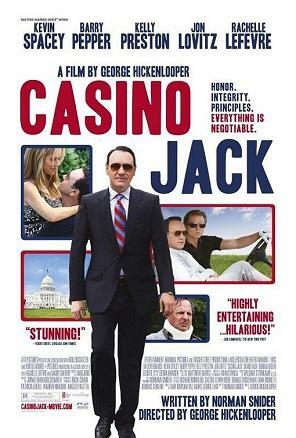 I’d like to see more films with the same style as Casino Jack, the dry comedic political satire. There were parts where the comedy reminded me of the comedy used in The Informant, which was a movie only I seemed to really enjoy. It’s a good way of telling a complicated and potentially devastating story, as Jack Abramoff’s potential future in politics and possibly even his whole life is in shambles by the end of this movie. We never feel that same devastation because of the light hearted tone of the movie. This isn’t to say it’s never dramatic. Of course it is, but it never turns from a comedy to a straight on drama. Casino Jack is not for everyone, as the mixed reviews from critics and audiences have come to show. If you have absolutely no interest in politics, then you would have no interest in this movie. The real kicker is that this is a true story, and not made up by some screen writer in his apartment. Sure its a dramatization and some of it is probably fictionalized, but the core of the story really happened. Casino Jack is a movie that will make you laugh, wonder, and criticize all at the same time. On a side note, director George Hickenlooper, died before the movie could be released which to me is a really sad thing. Kudos to you Mr. Hickenlooper for making your last movie a really enjoyable one. Each time I go to write out The Man From Nowhere, it normally turns out as The Man Who Wasn’t There, the noir style Coen Brother’s film. This is nowhere near similar. The Man From Nowhere is a South Korean revenge thriller with many cool moments and some twisted characters, which really work to its advantage. Unfortunately, due to some weak storytelling, this move never really reaches its full potential. Cha Tae-Sik’s (Won Bin) life is a total mystery to the people around him. He is a pawn shop owner whose only friend is an eight year old girl, So-Mi (Kim Sae-ron), whose mother (Kim Hyo-seo) is a drug addict and dealer. After So-Mi’s mother gets mixed up with a violent gang, she and So-Mi are kidnapped. This forced Tae-Sik back into the whorl using the skills of his violent path to rescue his only friend in the world. With this violent gang and the DEA on his trail, the odds don’t look like Tae-Sik will be getting out of this alive. Let’s start with the good. The main characters in this film are excellent even though they are surrounded by generic supporting characters. 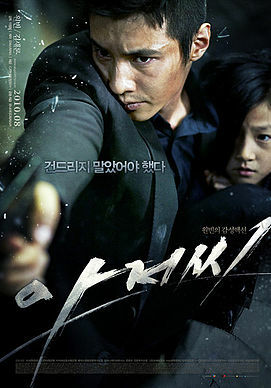 Won Bin pulls off the stoic loner with a rough past to perfection making him a believably badass character. Some of the fights he engages in are out of this world awesome, especially during a long knife fight towards the end. Kim Sae-Ron gives an impressive performance for being so young, and Kim Hee-won and Kim Sung-ho are devilishly twisted villains who are really easy to hate. The director, Lee Jeong-beom makes it obvious with The Man From Nowhere that he is a very talented film maker. His camera and acting direction is top notch. There is one specific shot of Tae-Sik jumping out of a window, and instead of the camera cutting away to the outside, it actually follows him quickly through the window. I can not figure out how this was done. Out of all of the parts in the movie, that one quick shot is what is sticking with me the most. The Man From Nowhere unfortunately does suffer from some weaknesses that don’t ruin the movie, but do prevent it from being excellent. The storyline involving the DEA is pretty boring with characters I have seen in a lot of other films. These law enforcement characters weren’t layered in any way, making them very difficult to care about. These bland characters are still overshadowed by the really great ones, so this is a very small complaint. What really detracted from the movie was the strange pace that it moved at. Having a slow moving gangster film is just fine, as well as a fast moving one. This one had no idea what it wanted to be, fast or slow. There will be times where the plot slow down to a crawl then out of nowhere speeds up to a crazy fast pace. This style of pacing may work for certain types of movies, but not for this one. In a way, I was a little bit disappointed with the The Man From Nowhere, but then I start thinking about it and like it a little bit more. I can’t really say how much I liked it for sure with my feelings for it changing with every passing hour. I’d say I’m very mixed on it. It’s definitely a good movie, but the pacing and bland supporting characters keep this film from achieving greatness. I will say that I’ll watch it again, and hope that a second viewing will help me to like it a little bit more. I’d say give The Man From Nowhere a try. As war and turmoil rages on in the Middle East, smaller and more personal battles continue on the home front as families are torn apart by the worst news possible. Hearing that a loved one has died one the battlefield is terribly difficult to hear, and this drama is wonderfully captured in The Messenger, with a few dramatic curve balls thrown in. Staff Sgt. Will Montgomery (Ben Foster) is a war hero who has been assigned with a job that he is not particularly happy about. Along with Captain Tony Stone (Woody Harrelson), he is given the task to notify families about their loved ones who have been killed in action. One particular widow (Samantha Morton) draws Montgomery close into her personal life, and he finds himself slowly falling for her, which is strictly against protocol. This summary doesn’t really do this film justice, since its more of a character study than a traditional story driven narrative. At the end of The Messenger, nothing much has really changed. The war still goes on and people are still dying, but the characters in the film have progressed even if it is only slightly. That’s what is the true strength of the movie. The audience is meant to care more about the characters than what the story is. If one was to focus just on the story, the film would probably feel pretty hollow and boring, which it is not. The screenplay for The Messenger is really marvelous with true to life dialogue that is never melodramatic and was nominated for an Academy Award for best Original Screenplay. There are a few lines that seem out of place like calling kids “green with envy” or some forced “good bye(s).” Other than that every line is appropriate. There is even a really good monologue said by Ben Foster towards the end of the movie that never sounds forced. The handheld camera work is also subtly fantastic at giving the film a more realistic feel. One shot in particular is eight minutes long and full of dramatic and emotional change. Seeing Ben Foster in a role where he doesn’t have to shoot or hit anyone was a nice change. It’s been established with movies like 3:10 to Yuma and The Mechanic that he can play a tough talking badass just fine, but now it is known that he is perfectly capable of playing a deep character who makes a great change throughout a movie. Woody Harrelson and Samantha Morton are also above average which also earned Harrelson an Academy Award nomination. 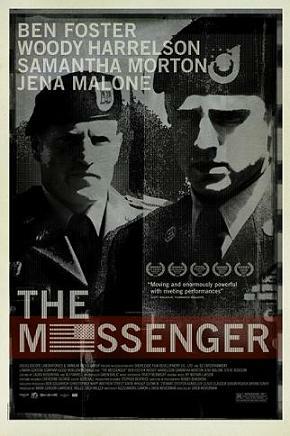 The Messenger came out the same year as The Hurt Locker, which is also about the tragedies surrounding the war in Iraq. Although the same themes are explored, they are done so in polar opposite ways. Deciding which film is more effective would be a very difficult task. Both do a great job, but I felt more impacted by the dialogue in The Messenger than the often flashy and violent material in The Hurt Locker, but this could just be because The Messenger is fresh in my mind. This was a quietly intense and emotional film that strikes many different cords. I’d like to see The Messenger defined as a classic in a number of years because of its presentation. I really enjoyed this movie a lot, and would recommend it to anyone. Ever since I got to college, a lot of time has been spent in class studying The Graduate, so it was only a matter of time before I actually got to reviewing it. To me, this movie is a classic and is full of memorable scenes that are used to convey the emotions that Benjamin feels. This is a very important movie, and I’m glad I’m finally reviewing it. Benjamin Braddock (Dustin Hoffman) has finally graduated college with multiple awards and honorable mentions. Now that he’s about to enter the real world, he finds himself to be very nervous about his future. This anxiety is relieved when he enters into an affair with Mrs. Robinson (Anne Bancroft), the older wife of his father’s partner at their law firm. This affair continues of requite some time until Benjamin is forced to take Mrs. Robinson’s daughter, Elaine (Katharine Ross), out, despite Mrs. Robinson’s protestations. Benjamin soon falls in love with Elaine and must unravel himself from the lies that he has caused from his affair in order to be with the one he loves. Dustin Hoffman gives a fantastic performance that jump started his career and earned him an Academy Award nomination for Best Actor. Anne Bancroft and Katharine Ross were also nominated, along with the cinematographer, producer, and writer. The director, Mike Nichols, won the Academy Award for Best Director, however. Bancroft and Hoffman have incredibly awkward chemistry that almost makes some of their scenes hard to watch. This isn’t a bad thing, however, because it gives the characters a massive amount of depth. All of the character are deep, but Benjamin and Mrs. Robinson are very believable. Technically speaking, The Graduate is a milestone. The editing and different uses of camera lenses give each scene a unique feel. For example, the use of a telephoto lens as Benjamin is running towards a church to stop a wedding makes it feel like Benjamin isn’t gaining any distance, even though he is running really fast. The cinematography also looks fantastic, with lighting that perfectly mimics the mood of the scene. A really effective part of The Graduate is how much Benjamin’s feelings of anxiety resonate with me, personally. The future is a scary thing, but it is never made into an impossibility. Benjamin spends the entire movie making really quick decisions, which is a very bad idea if you want to be successful in life. The last shot of the movie is exceptionally subtle at saying that this is not the end of Benjamin’s story, and we’ll never know if he goes on to live a happy life. It is said that this film perfectly captures and explores the theme of rebellious youth in the 1960s. For that time period it was probably true, but nowadays that theme is a bit played out and not very relevant in this case. That’s why the theme of the mysteries and fears of the future are what really support the story. It’s something everyone can relate to, which makes this movie very easy to understand. The Graduate is a classic in every sense of the word. This will be a film that will be relevant for many years to come because of its themes and performances. The techniques use to make this film were new and exciting at the time and are still being used today, which makes The Graduate exceptional in every aspect. Even the soundtrack by Simon and Garfunkel is something to enjoy. If you haven’t seen this yet, you are really missing out on one of the greatest movies ever made.